Download 10 Talismans for free at FreeRide Games! 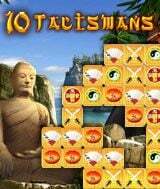 10 Talismans is a Match 3 game set to stunning oriental vistas and peaceful soundtrack of classic Asian melodies. Your quest in this game is to collect ten powerful talismans, said to bring wisdom, power, and fortune. To unlock the talismans you must clear the enchanted golden tiles off the game board by matching swords, Tibetan coins, lanterns, bells, gongs, scrolls and other relics into groups of three or more. 10 Talismans is a game of speed, skill, and strategy as you race against the wick that's burning to a barrel of gunpowder at the bottom of the screen. If it reaches the powder keg - time's up! Although your quest will be laden with obstacles such as brown tiles that need to be cleared twice and items that are chained down, you'll also have power-ups and special items to help you reach your goal. A soothing soundtrack of classic Asian melodies. Two game modes: Classic and Timeless.